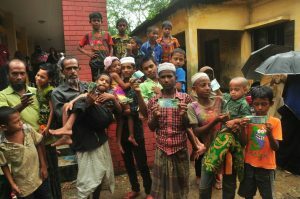 On Monday 12th June Biswanath 8UK distributed 72,000 taka to disabled people of Amtoil Village of Biswanath Upazilla. Cash money was handed out to people with disabilities from the Amtoil Government Primary school location. Locally the event was organised on behalf of Biswanath 8UK by Nurul Islam, Azmal Khan and supported by Kawsar Khan, UP Chairman Advocate Mohammad Alamgir spoke on this occasion as the chief guest. Social worker Emdadul Haque, UP member Abul Khayer, Biyan Sarkar of Biswanath Police Station spoke at this occasion. Former UP member Shahidul Islam Komla, Faizul Islam and Dudu Mia were also present . During this occasion 72 disabled people of Amtoil Village were given cash money of 1,000 taka each. The event was coordinated from the UK by Biswanath 8UK Vice Chair Azad Khan, supported by Secretary S.I. Khan, Senior Council member Habibur Rahman, Chair Monir Khan, Rumi Khan and Shebecca Khan. Biswanath 8UK is an organisation based in the United Kingdom with interests and ancestral roots in Biswanath Upozilla of Sylhet District, Bangladesh. Biswanath 8UK is governed by its own members agreed constitution and this prohibits participation or support of any political or religious organisation and their activities. To unite all the habitants of Biswanath throughout the World, to work collectively to the development of its habitants, identify issues that relates to Biswanath, prioritise issues and find sustainable solutions that can be developed in a way that benefits the habitants of the Upojilla. Learn from the history of Biswanath by highlighting the past achievements and focus on developing the skills and knowledge of the local habitants, improve computer literacy, establish local online e-commerce knowledge portal, provide vocational training, to allow habitants from Biswanath to communicate and trade throughout the World. If you wish to join this organisation please download, complete and submit the application form along with your admission fee.